Last week, while sailing Idle Queen back to her slip after a short daysail on the Neuse River, I greeted a couple on a Dutch-flagged boat. The man in the cockpit waved as we glided silently by. I motioned at the mop handle that they had rigged in the place where their mast should have been and said that there must be a story to go along with it. He said that there was, and that I should come by to hear it later. A couple of days passed before I saw them again, as I was busy working on preparing Sirocco to go back in the water. I was happy to finally catch up with them, as they seemed like very friendly people who obviously were having more than the usual share of boat trouble. 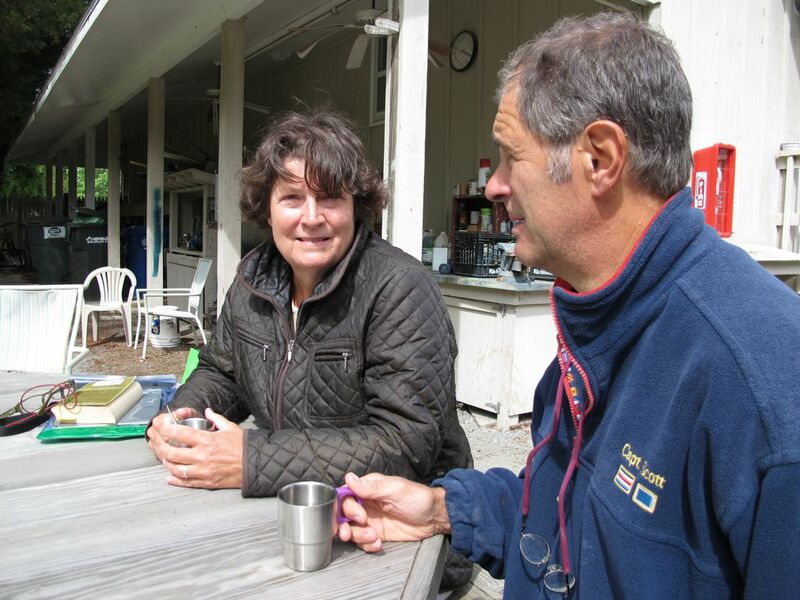 I was invited onboard Selena, their 33′ steel sailboat, introduced to Bas and Monique, and offered coffee and tea while Bas recounted his tale about what happened to the mast. After briefly considering what to do next (“What now, sit down and cry, activate my EPIRB and wait to be rescued?”), he knew that he must fight to get back to shore on his own. He acted quickly to free the rigging, as the sea state was still rough and the mast and boom were banging against the side of the hull. He studied the situation and concluded that there was no way to safely retrieve any of the gear. Bas disconnected all of the rigging and let his mast, boom, sails, and radar drop 4,000 meters to the ocean floor below. Bas called Monique with a satellite phone that she had given to him as a present to help stay in touch. He told her that he was 330 miles from the Beaufort inlet and that Selena was now a motorboat. The engine was in good condition, but Selena did not carry enough fuel to make it to shore. Bas motored to within 40 miles of Beaufort and then radioed the Coast Guard, who brought extra hands and sufficient diesel fuel in jerry cans to get him to Beaufort. Selena suffered some damage when the cutter bumped heavily against her side in the still-rough sea, but that was not a big problem. The bigger problem arose when Bas was told to put the engine in gear to move away from the side of the cutter. Nobody had noticed that one of the Coast Guard sailors had left a line trailing in the water, but Selena‘s propeller soon found it, stopping the engine with a thump. With the engine now out of commission, the Coast Guard towed Selena in the rest of the way. Bas had nothing but good to say about his experience with the Coast Guard. They were friendly and courteous as well as going about their work in a professional manner. He said that they were very apologetic for the extra damage and offered him forms for the repairs to be covered by insurance. Bas was surprised when Coast Guard sailors would come by just to chat and hear his story while he was in Beaufort deciding what to do next. After recovering for a short while, and having Monique rejoin him, Bas decided to continue north up the ICW. They motored out of Beaufort with a battered boat, but grateful that things weren’t worse. Unfortunately, it soon became apparent that there was more damage to be discovered. While motoring through Adam’s Creek Cut, Monique smelled burning coming from the engine room. It turned out to be coming from the shaft packing. On closer inspection, the root of the problem was worse than expected–the two rear engine mounts had broken from the casting of the engine block. This was a major problem, as the engine was English-built (BMC, British Motor Company) and almost 45 years old. The chance of locating parts for it was next to zero. 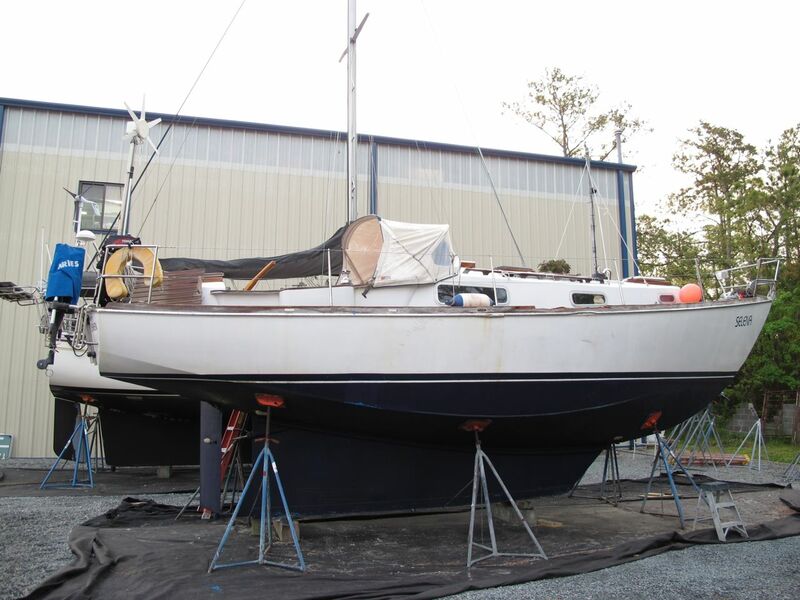 Selena out of the water for repairs. Selena made it to Oriental under her own power, and Bas and Monique took her to Deaton Yacht Service to begin working on getting at least the engine in working condition. Bas says that if they are not able to find a solution to at least mounting the engine that they would just have to let the boat go, as an old steel sailboat with no rig and no engine is not worth much, and re-powering would be cost prohibitive, as Selena‘s insurance refused to pay for the rig because Bas was alone on the boat when it failed. So, now Bas and Monique are stuck in Oriental with time ticking on their visas. The yard is working on the engine while Bas and Monique work on other repairs. They have been able to explore the area a bit, but they are growing anxious about what to do next. One of the biggest questions is how to get the boat home next season. Crossing the North Atlantic west to east is not a passage to be taken lightly. As Bas said, they have already done the easy part (the east-to-west crossing), and now the challenge is to get home again safely. One of my first thoughts after hearing this story was that there must surely be a good rig somewhere here on the east coast that could be had at a fraction of trying to re-rig Selena with new gear. Hundreds of boats have been wrecked in storms in the past few years, and I am certain that someone wants to sell their “used but good” boat parts. What is needed is everything above deck-level: mast, boom, sails, spreaders, wire–all of it. If we can find a rig in good condition, I am sure that Bacon Sails of Annapolis or somebody similar would have sails at a reasonable price. I am asking anyone who knows of anyone selling a rig to please comment here or contact me through the contact form here. Links to marine salvage yards and the like are useful. Please send along anything that you think might be helpful. For instance, surely someone knows of a 32-34 foot boat somewhere that was totaled but still has a good rig. Bas and Monique are not looking for free stuff, but rather something that is more modestly priced than buying it all new. They are a wonderful couple and I hope that we can help them avoid having to give up their boat.